Above: 2 Columbus Circle; Courtesy of Landmark West! 2 Columbus Circle opened in 1964 as the Gallery of Modern Art. It was built by Huntington Hartford, heir to the A&P supermarket fortune, to house his own art collection and serve as a bulwark in his passionate fight against abstract art. 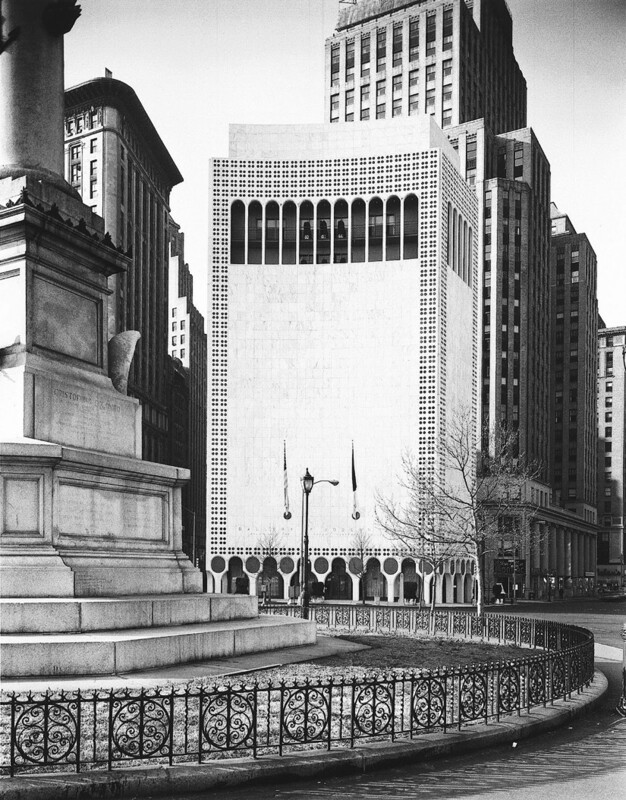 The architect Edward Durell Stone designed this building for the Gallery of Modern Art.1 It was designed in the romantic modernist style, and boasted marble cladding, Venetian motifs, and a curved facade.2 Ada Louise Huxtable, then the architecture critic of The New York Times, memorably characterized the structure as resembling “a die-cut Venetian palazzo on lollipops.3 In 1969, the museum was given to Fairleigh Dickinson University and converted into the New York Cultural Center, with the purpose of “present[ing] the contributions of all races.” Fairleigh Dickinson University ran the building until 1975 and held many art exhibitions. 2 Columbus Circle was converted into the Museum of Arts and Design in 2006. Brad Cloepfil of Allied Works Architecture redesigned this structure with a new facade. The building reopened in 2008. June 1996: A four-member committee of the New York City Landmarks Preservation Commission determines that 2 Columbus Circle did not have enough historical or architectural significance to have a hearing to discuss its eligibility for landmark designation. April 14, 2000: The New York Landmarks Conservancy, Historic Districts Council, and the Municipal Art Society co-sponsor a rally in front of 2 Columbus Circle to raise awareness for its preservation. November 24, 2003: The Preservation League of New York State lists the structure on its "Seven to Save" register. May 2004: Landmark West! launches a "Save 2 Columbus Circle" website. May 24, 2004: The National Trust for Historic Preservation adds 2 Columbus Circle to the list of America’s 11 Most Endangered Historic Places. June 21, 2005: The building is placed on World Monuments Fund's Watch List of "100 Most Endangered Historic Places" list. October 2005: Landmark West! mounts the 2 Columbus Circle "ShameCam," a webcam positioned in an apartment window at 25 Central Park West with a view south towards 2 Columbus Circle, to document the scaffolding going up around the building. 2006: 2 Columbus Circle is redesigned with a new facade by Brad Cloepfil of Allied Works Architecture and converted into the Museum of Arts and Design. In the end, the effort to preserve 2 Columbus Circle was significant. Many have drawn comparisons between the 2 Columbus Circle controversy and the historic demolition of Pennsylvania Station. The preservation battle involving 2 Columbus Circle has awoken preservation interests to the continuous threat to historically and architecturally significant structures. Preservation forces have been reminded that landmarks legislation is only as effective as its implementation, and many have begun to closely consider the losses that have occurred as a result.22 The 2 Columbus Circle campaign was also one of the first preservation battles to embrace and fully utilize modern technology in its advocacy efforts. In 2007, the New York Preservation Archive Project undertook a documentation project focused on the 10-year, grassroots-led advocacy campaign to preserve 2 Columbus Circle. This project is meant to provide preservationists and future historians with a primary resource to help them identify key elements of the campaign. Kate Wood, Executive Director of Landmark West!, a leader and close inside observer of the campaign constructed a timeline for significant events associated with the building and the campaign to save it. Much of the focus of this work is aimed at assisting others in extracting lessons for preservation campaigns to come. Please contact the New York Preservation Archive Project for more information on this project. David Dunlap, “For 2 Columbus Circle, a Growing Fan Club,” The New York Times, 18 August 2005. 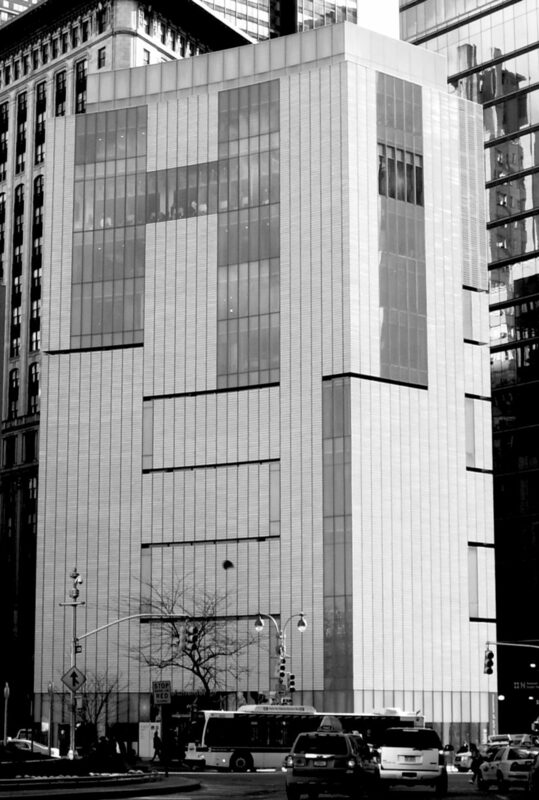 “2 Columbus Circle: former Gallery of Modern Art,” New York Architecture, 22 January 2016. Kate Wood, “The Campaign to Preserve 2 Columbus Circle: A Chronology,” New York Preservation Archive Project, 2007. David Dunlap, “On Columbus Circle, Hints of an End to an Enigma,” The New York Times, 7 March 2000. Daniel J. Wakin, “Effort to Preserve a Monolith,” The New York Times, 14 April 2000. Tom Wolfe, “The Building That Isn’t There,” The New York Times, 12-13 October 2003. National Trust’s Press Release, 24 May 2004. World Monuments Fund Press Release, 21 June 2005. “The New 2 Columbus Circle,” Gothamist, 2 May 2008. Anthony C. Wood, Preserving New York: Winning the Right to Protect A City’s Landmarks (New York: Routledge, 2007), page 375. Preservation League of New York Press Release, 24 November 2003. Municipal Art Society letter to Robert Tierney, June 30, 2003.